With my first 50k trail run just eight weeks away, it was time for a shot at half the distance to see how my feet would hold up. In the days leading up to the inaugural Paleozoic Trail Run 25k, Chicago would experience every single kind of precipitation imaginable. So it was with a sort of shrug and Ron Weasley face that Otter and I made the short, 25-minute drive from Chicago to Willow Springs. 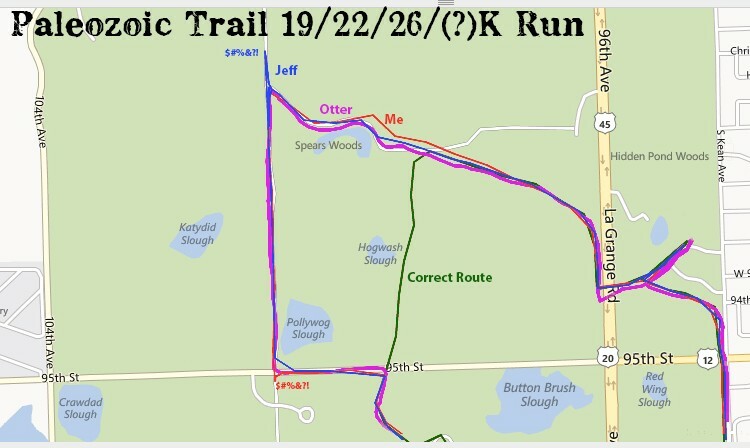 The race would take place at the Palos Forest Reserve, a large recreational area perfect for riding bikes, trail running and picnics. I had come here twice before to do some weekend trail running, but by no means did that mean I would recognize the course or be able to safely navigate my way through its serpentine paths. 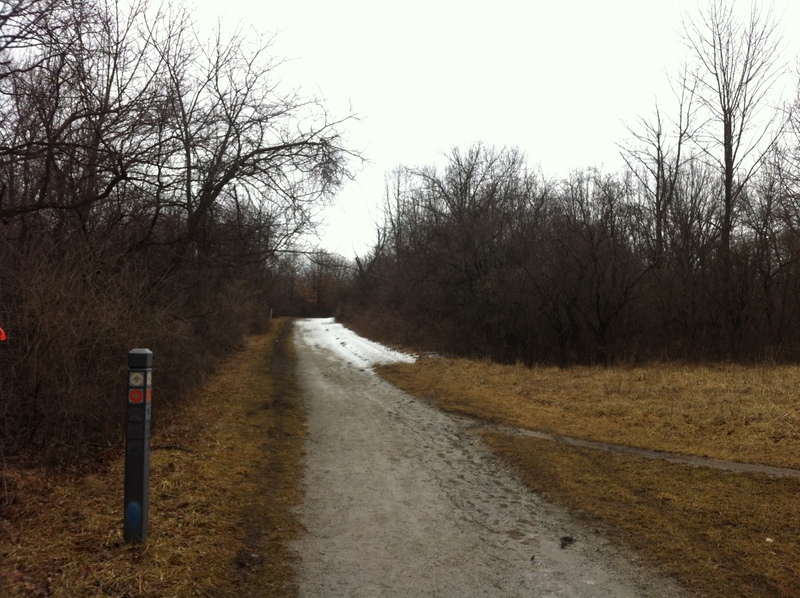 The week’s mix of rain and snow had made it so that the path would be both muddy and icy. As we got out of the car and walked toward the packet pickup, we got a taste of what the race would be like. A thick layer of brown leaves was covering parts of the ground, which made for excellent cushioning from hard-as-rock ice patches. The starting area was held next to a small lodge, where the organizers were setting up camp. It was surrounded by mud of all textures, but mostly the soft and slippery kind. It had been molded by hundreds of footsteps, looking like a frozen brown ocean in the middle of a storm. I have started running with a local ultra group called the New Leaf Ultra Runs (NLUR), and many of them were at this event. We huddled up with a few familiar faces and waited for the starting horn to blare. It was fun to compare this race to my most recent. In New Orleans, I was being ushered to and fro with exacting care by a large-scale, industrial event production company, bombarded on all sides and at all times with sponsor messages. Today, I was in a park, the chatter of runners the only noise to be heard. Three weeks ago, a huge colorful banner served as the opening gates for an event in which tens of thousands of people would participate. Today, only a few hundred people stood in shivering clumps waiting for someone – anyone – to tell us we could start running. It’s this kind of austere organization that makes you realize that trail and ultra-fanatics run for the sake of running and not for the bells and whistles. The 50k started a few minutes late. A group of us was engaged in a lively conversation when we were suddenly interrupted by a siren. There was no warning, no welcome, simply a loud noise telling the 50k warriors to go. About half of the crowd took off running over the sea of mud and into the parking lot, where they would round a corner and disappear into the trail system. We lesser 25k runners would have to wait fifteen minutes before starting. Those fifteen minutes were long. Temperatures were in the mid to high 20s and a rude wind was rushing through the campgrounds. We couldn’t wait to start. Once running, it didn’t take me long to warm up. I had brought a water bottle with me because most trail runs don’t pamper you the way road races do. My fingers are always the first to go, but a few miles into the race was enough to flush blood into them. At about 8-minutes per mile, I was running much faster than I ever have in this environment. The trail was wide enough for about four people to run shoulder to shoulder but with ice, snow and mud, there wasn’t enough “acceptable” terrain for everyone. So we were practically in single file for a long time. About ten people ahead, I saw Jeff (aka RunFactory) with his black and neon green Brooks jacket, running comfortably in his element. I decided to keep my pace and see how I’d feel in later miles. That didn’t happen. With very little elevation to slow us down, I soon found myself knocking out miles in the 7:25 range. I would reel in runners, zip by them on their left, and continue finding that perfect path away from ice, mud and tall grass. I wasn’t always successful and on more than one occasion, I’d get stuck in a mud puddle or slide like an arthritic marionette over an ice patch. But I kept on, following the runners in front of me. Around mile 4, I caught up with Jeff. “On your right, sir,” I said as I pulled even with him. “Hey buddy, looking good,” he said, his breathing suggesting that he was barely breaking a sweat. “I’ll probably see you in a few miles,” I said as I put some distance ahead of us. 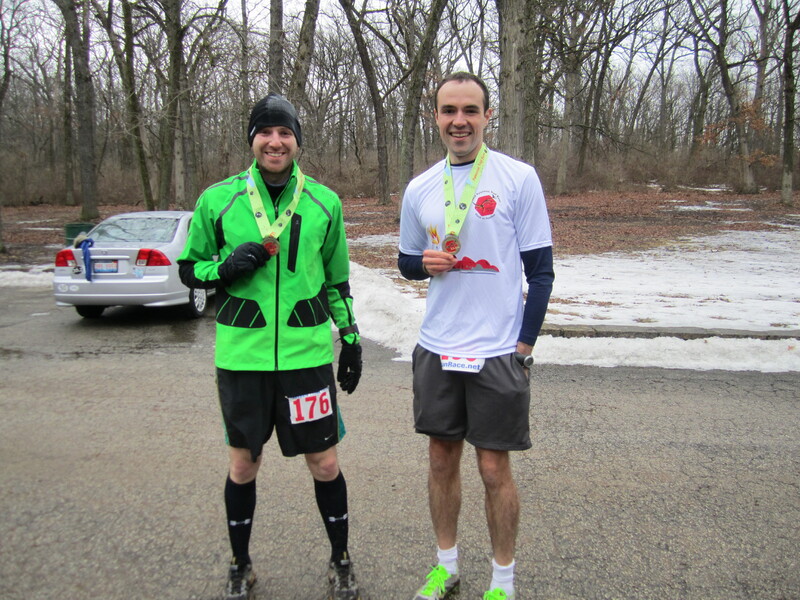 I had originally thought it was pretty badass of me to match and beat the seasoned ultrarunner’s pace. Turns out he was taking it easy. Whatever, I’ll take it. Somewhere around mile 7, we reached what looked like a main road and stopped. There were some runners ahead of us, having crossed the street, but a car had pulled over to the side and the driver had stepped out with a map. As we would soon find out, we were off course. Some of us yelled to the people ahead of us to come back. The helpful driver notified us that the entrance back onto the trail would be about 0.3 miles down the road. Our mistake. And since this is MY blog, I choose to assign Otter’s trail a bright fuschia. That was the first of many moments of disorientation. With only one exception, I’ve never questioned whether I’ve been going in the right direction during a race (that one exception being my midnight leg during the Madison to Chicago Ragnar Relay). You either have groups of people ahead of you to follow or there are proper markers telling you where to go. Today, that wasn’t the case. We were told that there would be color-coded signs at every split in the path, telling us which way to go (red = left, blue = straight ahead, orange = right). However, in many cases, these were nowhere to be found. I was blindly following the people ahead of me who were most likely following the people ahead of them. Once back on the path, I continued to eschew any pathfinding responsibilities by sticking to the (somewhat fast) couple running in front of me. I didn’t know it at the time, but we were retracing our steps, going back to the start. While I may recognize a place if I’ve been there before, I can’t do that if I’m traveling in the opposite direction. In other words, teach me a route and I will be able to replicate it, but tell me to find my way back to the start and I’ll most definitely get lost. The geeky ankle socks were my clean, dry pair into which changed post race. So ease off. My right foot was starting to hurt. It felt like my socks, which were pretty thick, had bunched up right at the ball and were pushing upward with every strike. I stopped and took my shoe off to examine it. There was no obvious problem, but just having it off for a few seconds made the pain go away. But in that pause, I had lost the runners that were leading me on the trail. Rather than rely on them for the course, I was now forced to actually pay attention to where I was going. I still hadn’t learned that we were on familiar terrain. Fortunately it wasn’t long before I reached the starting area. The second loop of the race was more secluded and narrow. I was told to follow the orange flags that had been interred into the ground, so follow them I did. However, I didn’t see anyone ahead or behind me for a long time. The trail was an unsightly mix of orange mud, snow and leaves. It almost looked like I was running on soggy peanut brittle. My pace slowed down considerably both because there were fewer places to run without difficulty and because my foot had started to act out again. I cursed more than once as I hit an uneven patch of hard snow, forcing the inside of my foot down at a painful angle. But onwards I pressed in search of the next orange flag. There was more than one split where I had to guess where the next flag would be only to see it around the corner. I was noticing an odd pattern. With every uphill, I would start losing all hope of keeping a decent pace, only to realize on the straight-aways that I could run at that pace forever. I decided I had to do more hill workouts if I was serious about joining the ultra clan. I soon found myself back at the open starting area but stopped running because I didn’t know where to go. Up ahead was the trailhead for the first loop, and to my right was a short dash to the finish. I would have shot straight to it had my watch said something closer to 25K (15.5 miles) instead of only 14 miles. Surely there was something I had missed. But I had followed all the orange flags and they had brought me back here. So after standing in place for about twenty seconds exchanging confused looks with other runners, I followed the marshal’s orders and began making my way toward the finish. I looked right and out of nowhere, there was Jeff. For some reason, we weren’t following the same path but were converging as we neared the timing mats. He was running fast, the anticipation of finishing clear in his stride. “Dude, what the hell, I’m only at 14!” I said as I joined him. At this point there was nothing separating us from the finish line except a mud slick. Given that neither of us had put in a particularly brutal effort at this race, I felt like it would have been rude to try and actually race each other to the finish. So I kept up the pace, heading for the unexpected finish. “Dude, you wanna hold hands as we cross?” Jeff said with a smirk. Three strides later, he repeated the question and I realized he wasn’t entirely joking. And so it was that we finished in a fit of airborne, feminine glee. The chatter at the finish line was all about distances, with everyone throwing out numbers, none of which seeming to coincide. Some runners were coming from the right, others from the left, all with a look of slight disorientation, but none with real concern. They were out here to run and no amount of logistical mishandlings was going to stop them. I ran back to the car and put on a change of dry clothes. While my intention was to stay for a while at the finish and take some pictures, I could only tolerate the chill for about ten minutes before I decided to head back to the car and wait for Otter. When he finally showed up, I learned that he had run closer to 16 miles. A few minutes later, a fellow finisher and very attractive girl would tell us she ran just 12. It wouldn’t be until later that I’d see where we all went wrong. You’ll note that Otter’s glitter trail and the Correct course are the same (GOOD KID BRING HIM HOME TO YOUR PARENTS), while Jeff and I totally punked out (HOODLUMS). As it turns out, there was a large loop of mostly single-track trail that I missed. While I will admit that I felt like an idiot for having cut a large 1.5-mile loop from the course, I assure you it was completely accidental. Seeing that the esteemed trail maestro did the same thing was a little validating. “It’s the inaugural year,” Jeff said at the finish line with a smile and a shrug. His sentiments were shared by a lot of people, including yours truly. And yet, I couldn’t help but wonder how much scorn the event would receive were it a standard road race. Runners can be a snarky bunch and for every easygoing participant you have a handful of mudslingers who take to message boards and fulminate with zeal. Though the race organizers don’t get a completely free pass – even the most forgiving runner will openly note the mistakes made at this event – the type of runner that signs up for this race will not go home scowling. This picture will weed out those of you who only click on my posts for the pictures. What? That can’t be right. There were many people ahead of me and … oh, right. I cut the course. Whoops. As of this writing, the organizers are trying to figure out how to post the results given that everyone ran their own distance and the start/finish line lacked any modicum of order. 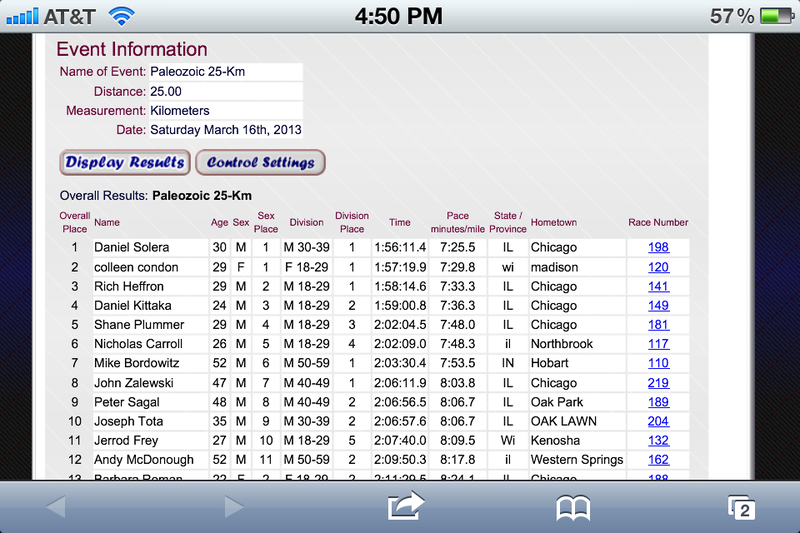 Still, it’s pretty cool to see your name at the top of a finisher’s list, however completely false as it may be. The truth is, I have a lot of work to do if I’m ever going to win even an age-group category at future trail races. 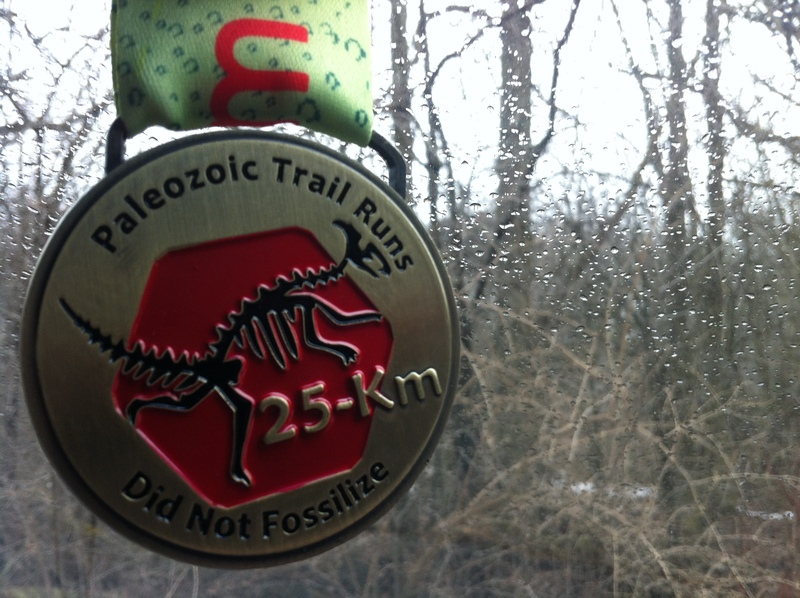 Fortunately, the Paleozoic Trail Run “25k” was a good stepping stone towards that goal. Next weekend, it’s back to the fast lane on hard pavement. 1. You might be the first person ever to DNF and win the same race. 2. Don’t think your mockery of my finish line celebration has gone unnoticed, DANIEL. Yes! DNF for the win. Love it. Jeff made me do it! I meant nothing by it … please … please don’t eat me with tiny T-Rex hands! So wait. 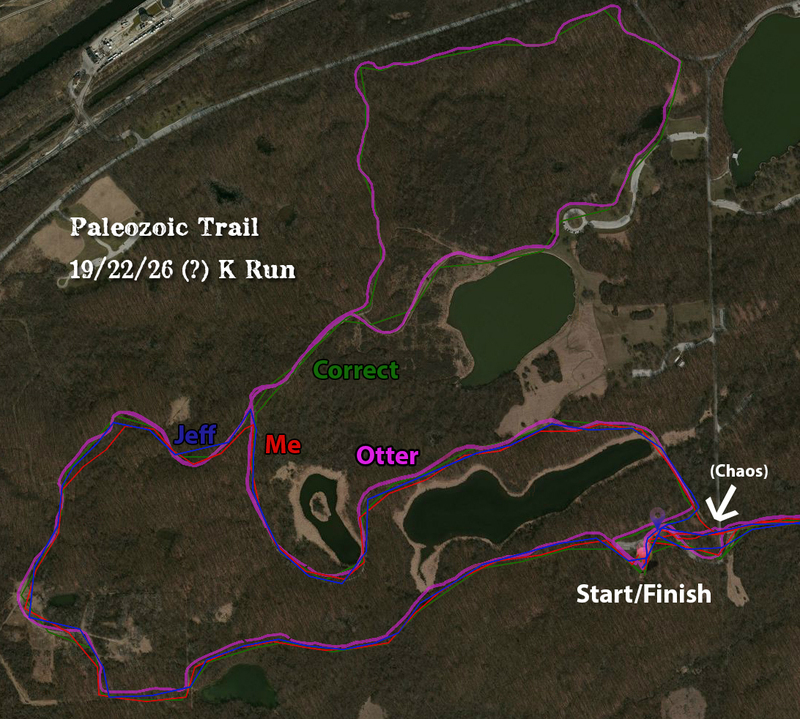 Why is it called the Paleozoic Trail Run? Were there dinosaur bones laying around on the trail? Did dinosaurs live in the Paleozoic Era? Well, if anything, it sounds like you had a good time. You hit the nail on the head with your observation about road runners getting pissed about missed turns. I once watched a woman have a meltdown that let into a tirade against the race director right at the finish line. (In fact, said woman refused to cross the finish line out of spite.) Good times. Good on ya, Herr Solera. Looking forward to more trail race recaps. I think the “Paleozoic” part comes from the fact that it’s in “Palos.” It’s “pun”ny. Thanks for tagging in, Art. I was befuddled not only by not knowing the answer but by not even bothering to research and explain it myself in this post. I should brush up on things like that. For example, figure out why it’s called the Flying Pig Marathon. Get on it, Glencino Man. Great write up as always, Dan! When I get to mine I’m going to default to yours for the details as your experience was very similar to mine. We did miss a section of the west loop but it wasn’t marked properly and lots of people missed it. We had fun anyway! Cheers! Cheers to that indeed, Jeff. I did have a fun time, hiccups and all. However, there should be a limit to how many things can go wrong at a race, trail or otherwise, before we all collectively say “Ok, come on, really?” I wouldn’t say that threshold was crossed at this race though. Onwards! Hilarious! No gold medals involved so nothing to get to excited about. Sounds like one hell of an adventure though. I ran the 25k as well. I didn’t hit the north part of the final loop either. Guess I punked out as well! All in all it was a good time! If only it WAS a large-scale event and your flouncing finish was photographed! Nice job, and I am, as ever, copping a perv of your medal. Whilst I am in complete agreement, the word ‘papped’ as a substitute for ‘photographed’ is alarmingly close to an uncomfortable visit to the doctor, and therefore trumps ‘photog’. As for the lack of cameramen, surely it’s high time you hire your own paparazzi, if only so you have plenty of options for the glossy spread in the middle of your autobiography: ‘Dan Solera: Faster than a Snot Rocket’. Man, I snagged a nerve with that term huh? What about booger blast? Mucous missile? Nasal project-bile? Tell me when you vomit and I’ll stop. Nice! 🙂 Looks like an awesome trail/place to run. 🙂 The name “Paleozoic” makes me think of dinosaurs in Paleo diet. LOL! Way to DNF/Win. Sounds like the organizers have a little work to do in marking trail- but it also sounds like you’ll do great for your first real ultra! Good work! I am half sure I asked already- but you’re not by chance doing the Allerton Trails half marathon in Monticello, IL April 6, are ya? Thanks for reading! I’m afraid I’m doing the Shamrock Shuffle that weekend, so it’ll be a fast road weekend. I take it you are hitting up those trails? First, I think it’s absolutely hilarious that you “won” the race. That’s a story for the ages. Second, your story is a bit of why I haven’t done any trail races yet. The whole thing about everyone running different distances, missing turns, getting lost in the woods is what I actually EXPECT from a trail race. You’ve just confirmed my pre-judgment (regardless of how incorrect it is). Thanks for reading, Jack. Though I don’t have the experience to back this up, I’m pretty sure my experience wasn’t necessarily the norm. Trail running isn’t just for budding cartographers or the navigationally gifted. I’m confident that if you pick a race in its 4th or 5th year you’ll find that you can easily find the path ahead of you. That said, it looks like you’re having plenty of fun on the roads so far. The trails can wait … for now. Though I’d agree your experience wasn’t the norm (your win notwithstanding), it’s not unheard of either, especially for inaugural events. 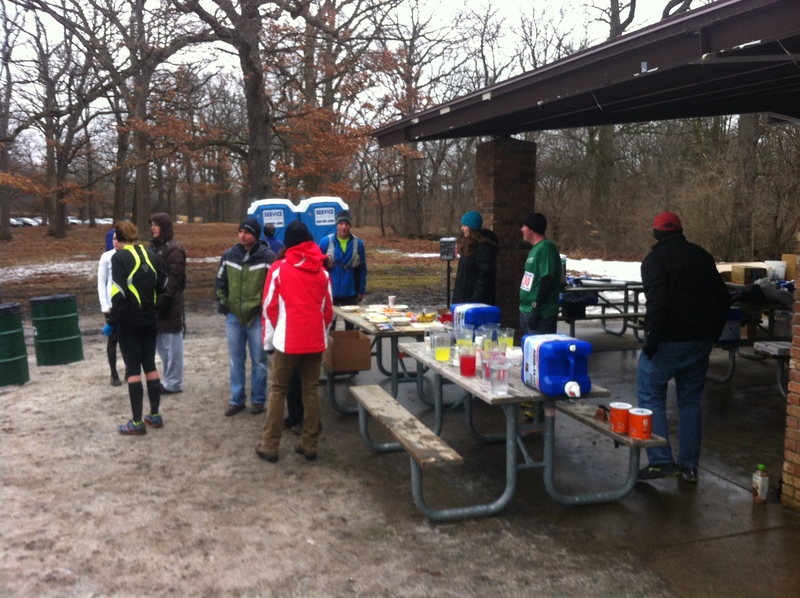 You’re a brave man to sign up for a first-year trail event near Chicago in mid-March. And to wear shorts in 20-degree temps. On second thought maybe “brave” isn’t the right word. Your recap generated more snickers for me than a night of trick-or-treating… Katie kept glancing over and asking what I was reading. You have to admit, that made for a more compelling tale than 15.5 miles at 7:25 per would have. Love the maps, even if I do wake up cross-eyed tomorrow because of them. I think you’ll find that unlike the Paleozoic 25K, most of the trail races you’ll run will end up being longer than their advertised distance. I prefer it that way, since I always feel cheated when a course is marked significantly short. Nice job, but be warned… this trail-racing thing may start to grow on you.